Partly cloudy this evening followed by increasing clouds with showers developing after midnight. Low 42F. Winds light and variable. Chance of rain 50%.. Partly cloudy this evening followed by increasing clouds with showers developing after midnight. Low 42F. Winds light and variable. Chance of rain 50%. BILLINGS — Nobody in Al Whitney’s family has ever needed a blood transfusion. But that’s not why he is the force behind a program called “Platelets Across America,” and not the reason he started donating whole blood back in 1965. Whitney said he was simply inspired by a sign in Avon Lake, Ohio, asking for donors. Not long after his first donation, he contacted a nearby blood bank about organizing a blood drive at his church. With that support, Whitney donated blood and coordinated drives every eight weeks. In the early 1970s, he decided to donate blood platelets rather than whole blood. “Platelets are primarily used by cancer patients and burn victims,” Whitney explained. “They act as the clotting factor in the blood. According to information from United Blood Services in Billings, platelets are also used in large quantities by aplastic anemia and marrow transplant patients. They are also used during surgery to help stop bleeding. Whole-blood donations contain around an ounce of platelets, and it takes between five and 10 donors to provide enough platelets for a single transfusion. When someone gives platelets — called a pheresis donation — a cell separator collects the donation, removes the platelets and returns the rest of the blood back to the donor. In the two hours it typically takes to donate platelets, one donor can provide enough for one transfusion. In 1985, Whitney expanded his blood drive efforts and scheduled one every Saturday and once every eight weeks on a Monday evening. That worked out to about 56 blood drives each year. In 2000, Whitney’s final year of organizing drives, his events brought in 2,069 units for LifeShare Community Blood Services in Elyria, Ohio. He, of course, continued to donate platelets. 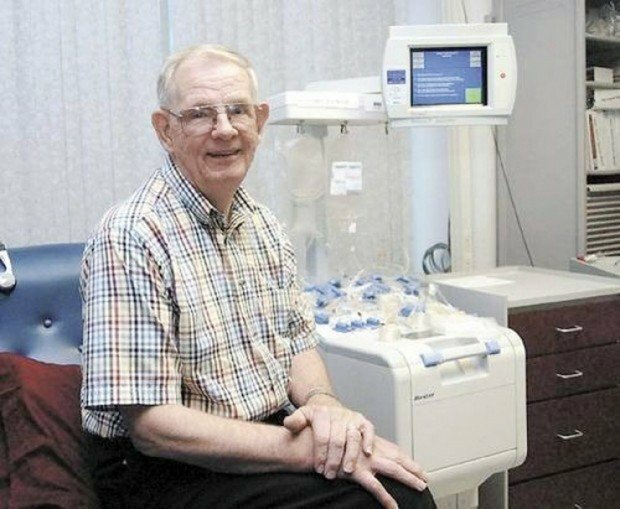 Deciding to donate platelets in every state across the United States, he worked with America’s Blood Centers and launched Platelets Across America. So far, Whitney has hit 48 states, including Alaska and Hawaii, with two to go: Montana and Wyoming. Rigney said Billings has the only center in Montana with the resources to collect platelets, so where Whitney would donate was an easy call. Whitney has also donated platelets as far away as Canada and Australia. Out of every 100 people, Whitney said only about 37 would be eligible to donate blood or platelets for various reasons. Out of that 37 people, only an average of 1.8 actually do donate. “I remind these places what I learned in my years as a volunteer for successful blood drives,” he said. “Do you know what one of the major reasons is that people don’t donate? After Whitney planned to donate in Billings last week, he headed for Casper, Wyo., on Aug. 8. He plans to make return trips to the many states that are interested in having him back. 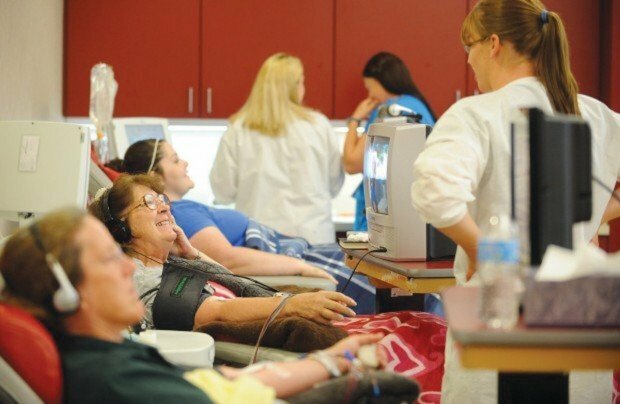 Donating platelets is not painful and is very safe, according to United Blood Services. Plateletpheresis donors must be at least 16, weigh 110 pounds and be in good health. The entire process usually takes two hours or less. The human body is able to replenish its supply of platelets quickly, and donations can be made every seven days. Catch the crosstown rivalry between Butte High School and Butte Central Thursday night in Butte. See inside for player profiles and more!